This is an ACA sanctioned event. All participants in ACA-insured activities must wear properly-fitting U.S. Coast Guard-approved lifejackets (Personal Flotation Devices, or PFDs) at all times during on-water activities. Non-HASK participants must sign a waiver. See all rules at the bottom of this page. Register early for campsites by emailing me. I have reserved four and will assign them to registrants. Important! How many registrants I take also depends on how many people share campsites. If I run out, you are welcome to make your own registration. See below for the link. 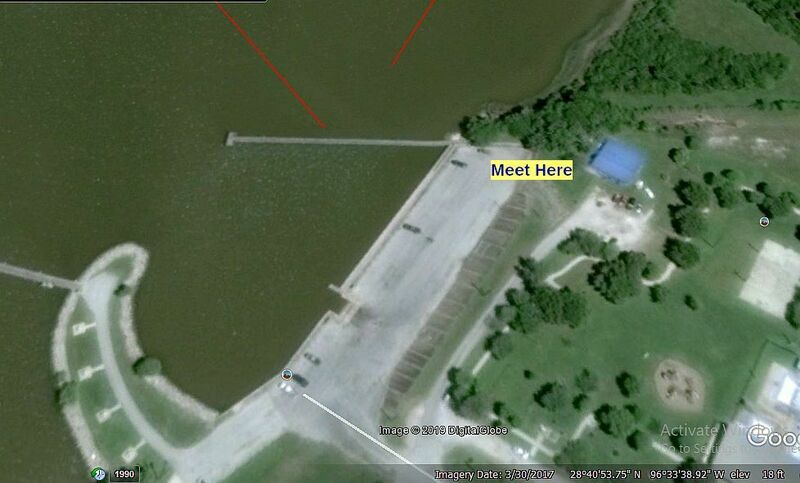 Meet at 11 AM Waterfront Park; 905 Lamar St; Point Comfort, TX 77979 for a 12 Noon put-in. Paddle in a northerly direction to Swan Lake and back. 7.6 Miles. Pack a mid afternoon snack. We can vary our route. Return to the put-in at 4:30, drive back up to the Lake Texana Campground. 1. Car camping Friday and/or Saturday nights at Texana Park & Campground, formerly Lake Texana State Park. 3. Saturday day paddle on Garcitas Creek. 4. 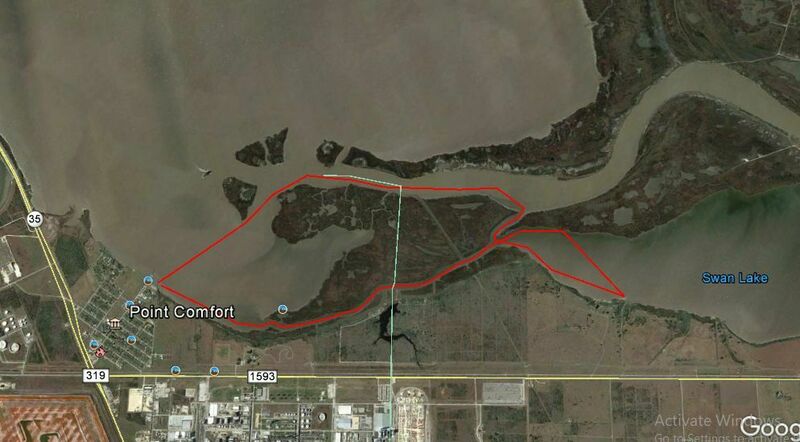 Sunday day paddle on Mustang Creek or Lake Texana (weather dependent). You can come down and paddle Saturday without camping or add camping and possible trip Sunday morning. Contact me if you are camping. Let me know by email which night(s) you are camping. I have reserved 6 campsites (5 are lakefront) in my name, numbered 77 (Bill Ohsie is one occupant), 78, 80, 82, 84 and 85. The campsites are $30 per night per site. These sites will have electricity and water but not sewer hookups. They can each accommodate three tents or an RV plus 1 tent. If you want full hookups or a site by yourself, register on your own by calling 361-782-5718. Check-in time is 2:00 PM and check-out time is 1:00 PM. Camping fee is $30 per site per night. Multiple people at each site will share the fee. I will collect payments at the park. A few of our HASK brothers and sisters view camp cooking as a ‘Sacred’ culinary art. Yet, most of us are willing to wolf down mass quantities of gruel (e.g., instant grits or pastas, etc.) washed down with the swill of their choice (e.g., bad cowboy coffee or high fructose concoctions)…even during our far-less-limiting, car-camping adventures. Usually, this is done in the interest of time and, mostly, for convenience’s sake. But, Bay City member, Willie Younger, has arranged for a duo of masterful Iron Chefs to provide a hands-on field course on preparing campfire-fueled, Dutch oven cuisine on the afternoon of Friday, May 3, at our Lake Texana campground. This fun-filled instruction will climax with an evening meal that includes main dishes, breads and dessert to be enjoyed by all campers (signaling…”Count me in!”) and our guest instructors (and, hopefully, their charming spouses as well). FYIs – for those choosing to participate in this class (i.e., yes, you can opt out), food/supply expenses (i.e., for supper and, maybe, breakfast too) will be pro-rated and billed separately from the camp site fee incurred. Those participating are encouraged to bring any and all cast-iron Dutch ovens, skillets, griddles, cornbread molds, etc. and accessories they possess. In doing so, the varieties of cook wear can be displayed and freely discussed regarding their distinct advantages and disadvantages. It could also provide an open window for some willing soul(s) to prepare a group breakfast on Saturday using their new-found (or pre-existing) knowledge. Any generous volunteers out there? Information on camping reservations is at http://www.campingfriend.com/TexanaParkandCampground/default.asp?source=CAMPINGFRIEND. Don't use the information on the TPWD website because the park is now run by the Brackenridge Park and Campground. Description: This is a HASK trip on Garcitas Creek. We will gather at 9:30 AM and decide whether to make it a one way trip with shuttle or and out and back trip. Directions: From Houston, take Highway 59 South and exit onto FM 234 not too far south of Edna. Turn left on FM 234, travel 10 miles to FM 616. Turn right on FM 616 and travel about 5-6 miles to the boat ramp on Garcitas Creek on the right before going over the bridge. There are no facilities at the boat launch. There may be something when you exit Hway 59 or some little town on the way, but to be sure, exit in Edna if you need a bathroom. Hazards: There are alligators in the area and all the usual suspects of SE Texas. Keep an eye on this space for information updates. This is an ACA sanctioned event. All participants in ACA-insured activities must wear properly-fitting U.S. Coast Guard-approved lifejackets (Personal Flotation Devices, or PFDs) at all times during on-water activities. Non-HASK participants must sign a waiver.his is an ACA sanctioned event. Every participant must wear a PFD.